To Complement our premium cover is our…. To ensure long-term performance, all frames of our standard Dome shelters are structural grade steel tubing with a special Galvalume finish that yields superior weather-ability. Lab and field testing has proven Galvalume coated steel to demonstrate rust resistance six times that of conventional galvanized steel. In addition, we have taken the extra steps to cold galvanize all weld areas, as well as introducing a new acrylic clear coat to our steel tubing, to further increase its rust resistance and clean finish. 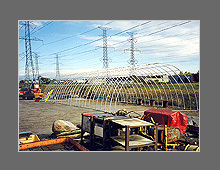 Our standard Dome Shelter Systems have steel tubing ranging from 1 1/4" round to 2 3/8" oval in size, depending on the size and usage of the shelter. We offer both dome style and peaked roof gable style shelters, ranging from 8 to 36 feet wide, from 8 to 17 feet high and to any length at 3 or 4-foot increments. All you need to do is choose the standard size that suits your needs and we will do the rest. If you have any other specific needs that our standard sizes cannot meet, we can offer you the option of larger truss-style buildings up to 120’ wide. Please contact our sales representatives for further details, and we will be more than happy to assist you in working out the solution for your unique application. All of our standard Dome™ shelters are BUILT TO LAST. 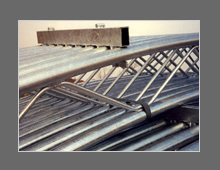 All base steel frames are built with heavy gauge steel tubing and specially engineered profiles that are designed to withstand in excess of 75 mph winds and up to 45 psf of snow loads**. In addition, our acrylic coated Galvalume™ frames can be relied on to remain smooth for decades, protecting your cover from abrasion damage. If a building permit is requested by your municipality, we can provide you with a package that includes an engineer’s sealed drawing of the structure and documentation on the cover material for your submittal to the appropriate authorities. Additional engineering costs may apply to make structural changes to our standard design in order to meet building code requirements pertaining to each local jurisdiction. 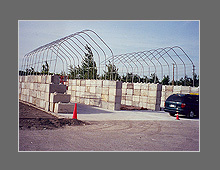 Please call our sales office for further information and check with your municipality for building code restrictions. *Design snow loads vary somewhat for different sizes, shapes, and building code jurisdictions. Please contact our sales staff for specific loads for your application.